U.S. President George W. Bush pressed China to expand religious, political and social freedoms and won renewed promises — but no concrete actions — from President Hu Jintao to open China's huge markets to U.S. farmers and businesses. Hu said the two leaders sought an outcome of "mutual benefit and win-win results." But their meeting Sunday at the Great Hall of the People on the edge of Tiananmen Square appeared to produce no breakthroughs on U.S. demands for currency reforms in China, and no details about how China would cut its trade surplus with the United States, on track to hit US$200 billion this year. Mr. Bush's two-day China stop — his third as president to the communist giant — was the centerpiece of a weeklong Asia tour, which also includes a four-hour stop in Mongolia on Monday. But during his tour, an acrid debate at home about the war in Iraq has followed him. While overseas, the White House has not let a day go by without a no-holds-barred verbal counterattack against Democratic critics of the president's war policies. to anti-war filmmaker Michael Moore (video). Mr. Bush appeared determined Sunday to scale back the rhetoric. Appearing before reporters at his hotel before he attended a lavish dinner with his Chinese hosts, Mr. Bush rejected the notion that it is unpatriotic to disagree with him. "People should feel comfortable about expressing their opinions about Iraq," he said. "This is not an issue of who is patriotic and who is not patriotic. It's an issue of an honest open debate about the way forward in Iraq." A Chinese crackdown on dissidents before Mr. Bush arrived dismayed U.S. officials, and Secretary of State Condoleezza Rice said the U.S. side would continue to raise the issue "quite vociferously with the Chinese government." She also expressed disappointment with China's response to a U.S. request in September for action on specific human rights cases — a list Bush described bluntly as "dissidents that we believe are unfairly imprisoned." "We've certainly not seen the progress that we would expect," Rice said. Yet Bush took satisfaction in the fact that Hu mentioned human rights when the two leaders made joint statements to the press. "Those who watch China closely would say that maybe a decade ago, a leader wouldn't have uttered those comments," Bush said. "He talked about democracy." No questions from the press were permitted during the joint appearance by Bush and Hu, so the U.S. president's give-and-take with reporters on his own was scheduled later in part to make a point about press freedom. Bush said he pressed Hu for fairer treatment of non-governmental charity organizations that operate in China and suggested that the Chinese invite the Dalai Lama, the exiled Tibetan spiritual leader, and Roman Catholic leaders to China to discuss religious freedom. 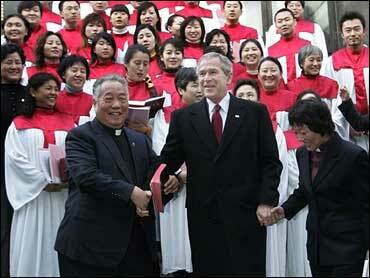 Bush's first public event during his visit was a worship service at Gangwashi Church, one of five officially recognized Protestant churches in Beijing. "It is important that social, political and religious freedoms grow in China," the president said at Hu's side. Later, Bush said pressing for religious freedom was a good way to ensure that other freedoms follow. "They go hand in hand. A society which recognizes religious freedom is a society which will recognize political freedom as well," he said. "President Hu is a thoughtful fellow, and he listened to what I had to say." China's massive trade surplus is a political headache for Bush. As the president opened his visit, U.S. officials spread word that Beijing was buying 70 737 planes from Chicago-based Boeing Co. The administration said the purchase was "a testament to how our approach to China is yielding real results." But in a joint appearance with Hu, Bush said China needs to do more to provide fair opportunities for American farmers and businesses seeking access to China's market. Later, Bush specifically cited a desire to sell U.S. beef in China. He said China also needs to work harder to protect intellectual property rights. Piracy of U.S. movies, computer programs and other copyright material is rampant in China. Rice suggested that China is beginning to take the problem more seriously, and that Hu talked about specific steps to crack down on piracy. Bush is pressing China to quickly revalue its currency, the yuan, which U.S. companies contend is undervalued by as much as 40 percent, making Chinese goods cheaper in the United States and American goods more expensive in China. "We've seen some movement but not much in the currency valuation," Bush said. Hu promised Bush that China will move to reduce its trade imbalance with the United States, but he did not discuss any specific steps. He said China was willing to step up protection for intellectual property and would "unswervingly" press ahead with currency reform. The two leaders readily acknowledged differences but stressed cooperation in preventing and controlling bird flu and persuading North Korea to abandon its nuclear ambitions.